After the very long time Mixromax most loved affordable Masterpiece, Micromax Canvas Spark up for the Flash sale via the Snapdeal Official site. Register for the 15th September Flash sale to get your favorite smartphone device at Rs. 4,999 Plus 100 Rs Delivery charge. 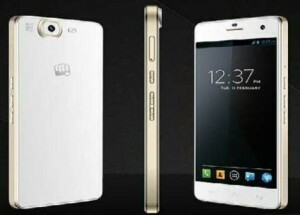 Micromax Canvas Spark best known for the Advanced Smartphone specifications and its high end features. More importantly its impressive prince is the key factor for many buyers. If you are one of them who didn’t get the Smartphone in previous flash sale then you are Good to go with Next flash sale on 15th Septemeber. 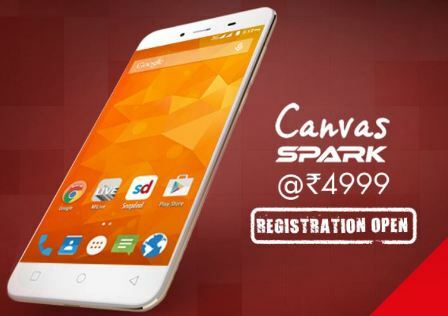 Register now for the Micromax Canvas Spark Flash sale, Registrations ends on 8 PM on 15th September. 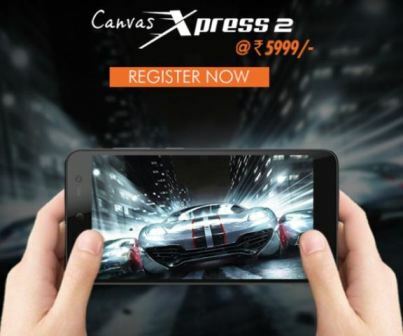 Micromax Smartphone company’s newly launched Affordable Smartphone Canvas Xpress 2 to go on sale via the Flipkart official website. Smartphone is available at the Impressive Prince of Rs. 5,999 only. You will get the Advanced Smartphone Specifications listed below. Its gonna be the Flash sale and you need to register the device before the sale goes live. Moreover you need the Faster internet connection as Micromax gonna sale the several units at the same time and only limited units will be available to sale. So Hurry up, Go and Register free for Micromax Canvas Xpress 2 Octa-Core smartphone Flash sale and Tune in Back on time of Sale. Registration window started on Sep 01, 06:00 PM and will remain open till Sep 07, 11:59 PM. So this are the Advanced Specifications of Affordable Micromax Canvas Xpress 2. There are only limited units for sale and there is more demand of the smartphone so who one hits the Flipkart early can get the first. Register below if you are interested. Popular Smartphone maker Micromax launched new Canvas Tab P680 Tablet which has the dual box speakers on Canvas Tab P680. It has the Android Lollipop 5.0 version with 20.32 Cm IPS display. Smartphone carries the 800*1280 screen resolution and has the 16 GB internal memory and expandable up to 32 GB. 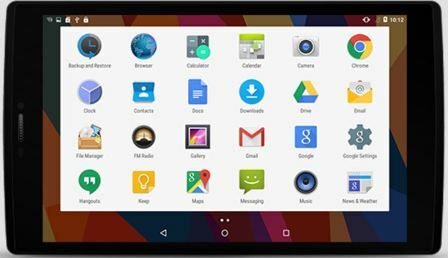 Micromax Canvas is the affordable advanced Tablet by Popular smartphone maker Micromax. See the detailed specifications below. Its has more connectivity options including Voice Call Support, Wi-Fi Connectivity, Bluetooth and OTG USB cable.It has the Last Longer battery life. Get face to face on video chats with over 8.5 hours of 3G talk time. Make the most of 3 hours* of video playback, 5 hours* of browsing time and over 250 hours* standby time. Several pre loaded apps also available named Clean Master, NewsHunt, WPS Office and more. Micromax Canvas Sliver 5 Smartphone, World’s Slimmest Android Smartphone unveiled by the company. Its the very professional in Look with Advanced processing power and capabilities. Its the 5.1 mm slim smartphone has the 2.7 mm Visual Perspective. Moreover its the lightweight of 97gms supports the 1st 4G LTE below 100 gms. Smartphone offers the Faster 4G connectivity with 150 Mbps Download speed and 50 Mbps Upload speed. Canvas Sliver 5 housed with 64 bit 1.2 GHz Qualcomm Snapdragon processor with 2 GB of DDR3 RAM. Micromax Sliver 5 has the revolutionary design with Stronger and durable support. Smartphone has the 12.19 CM (4.8 inches) HD AMOLED screen with Corning Gorilla Glass 3. Smartphone offers the 1280*720 Screen Resolution. Mobile Camera is of 8Mp AF rear with wide angle lens. It has the 5 MP front facing camera for selfies. Its battery is of 2000mAh capacity which offers the 8 hours of talk time and 345 hours of stand by time. Android Lollipop 5.0 smartphone has the much more Advanced features and available with the pre loaded apps like Housing, Hotstar, App Center, Quikr, Scandid, Clean master, Snapdeal, NewsHunt, Chaatz and Swiftkey. 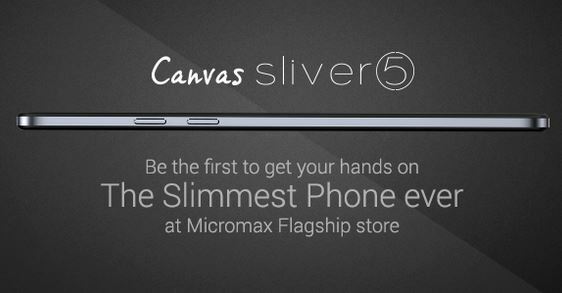 If you are Interested in Slimmest Sliver 5, then Step into the Micromax Flagship Store this weekend for the Slimmest Sale Ever! Visit G 26, 2nd Floor, South Ex Part 1, New Delhi. Offer valid till stocks last. Micromax launched Canvas Knight 2 4G smartphone in India at the Price of Rs. 16,299 In India. Both the nano sim smartphone has the 4G connectivity support. 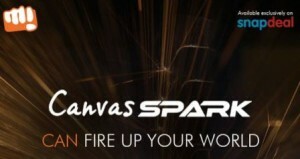 Micromax Canvas Spark was buzzing after the official launch and company recently announced the Canvas Spark 8th Flash sale via snapdeal. Smartphone sports the 5 inches HD AMOLED display with 1280 X 720 pixels resolution and has the Gorilla Glass 3 Protection support. Handset is the 64 bit Qualcomm Snapdragon 615 Octa core processor paired with 2 GB of RAM.